Alpha And Omega: The Legend Of The Saw Tooth Cave DVD Giveaway! Fine Print: I was given a copy of the movie for review and one is going to a reader. All opinions and statements below are my own. 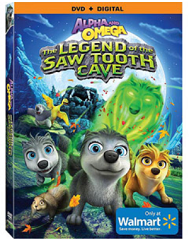 The Alpha And Omega: The Legend of the Saw Tooth Cave DVD has just been released exclusively at Walmart and it is a fun movie for the kids! To get everyone excited about this new release, I’m giving one lucky winner a copy of Alpha And Omega: The Legend Of The Saw Tooth Cave DVD! To enter this giveaway, complete any or all of the options listed below. Giveaway ends 10/4. Good luck! I think Alpha and Omega should have an adventure in Japan. I think the next one should be Alaska. I think they should go to Hawaii cause that is where I want to go. I think Yellowstone National Park! for their next adventure! How about the North Pole? I think they should go to New Zealand. I’ve always wanted to go there. I Think Alaska would be a great place! I think Alpha and Omega should go to Florida on their next adventure.